The use of enzymes as a feed additive has rapidly expanded during the past decade. Although the economic and social benefits of enzymes have been well established, more research and development are needed if enzymes are to reach their full potential in the industry. This book addresses some of the more urgent areas for research and development. It points out that the use of enzymes in feeds is only in its infancy and that many exciting developments can be expected, particularly with the use of recombinant enzymes for a wide range of animals and animal feedstuffs. Enzymes not only will enable livestock and poultry producers to economically use new feedstuffs, but will also prove to be environmentally friendly, as they reduce the pollution associated with animal production. In addition, the book demonstrates that enzymes are a very useful tool in the study of physiological and metabolic mechanisms. 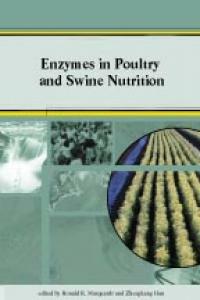 Such studies will enhance our understanding of the role of dietary enzymes in animal nutrition. Zhengkang Han is Professor Emeritus and former Head of the Laboratory of Animal Physiology and Biochemistry, Nanjing Agricultural University, Nanjing, China. Prof. Han is a consultant for the textbook committee of China's Ministry of Agriculture, vice chair of the degree committee of Nanjing Agricultural University, and a member of the National Natural Science Foundation of China committee that awards grants for animal, veterinary, and fishery sciences. Ronald R. Marquardt is Professor of Animal Nutrition and Biochemistry in the Department of Animal Science, University of Manitoba, Winnipeg, Manitoba, Canada. Prof. Marquardt has been an associate editor and editor of the Canadian Journal of Animal Science, served as a member on two grant-selection committees for the Natural Sciences and Engineering Research Council of Canada, and been a member of the Council of Animal Nutrition for the US National Academy of Sciences.